Yesterday, as American Airlines flight number 591 was boarding in San Francisco (destination Dallas), a female passenger had her stroller reportedly "violently" taken from her by an employee. During this action, she was incidentally struck - and her infant was almost inadvertently hit. 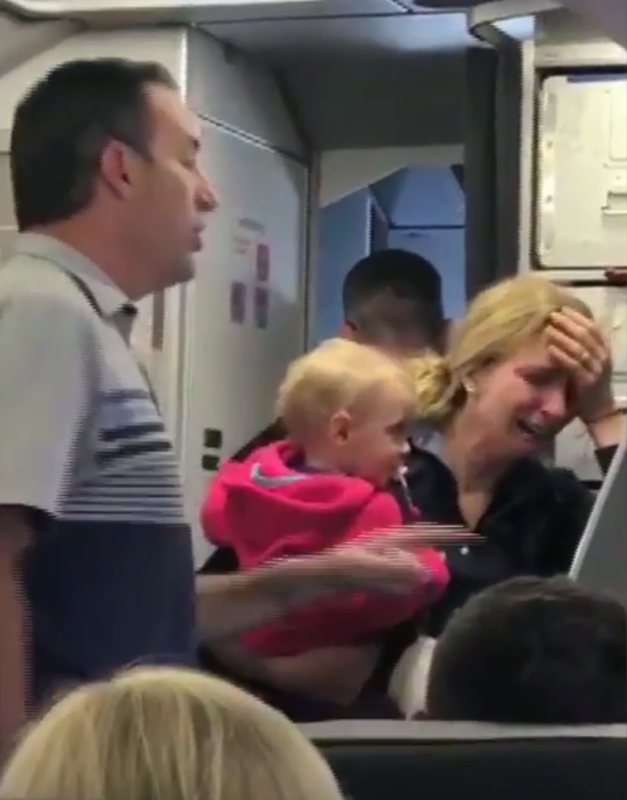 The woman understandably became visibly upset and a male bystander passenger then intervened. 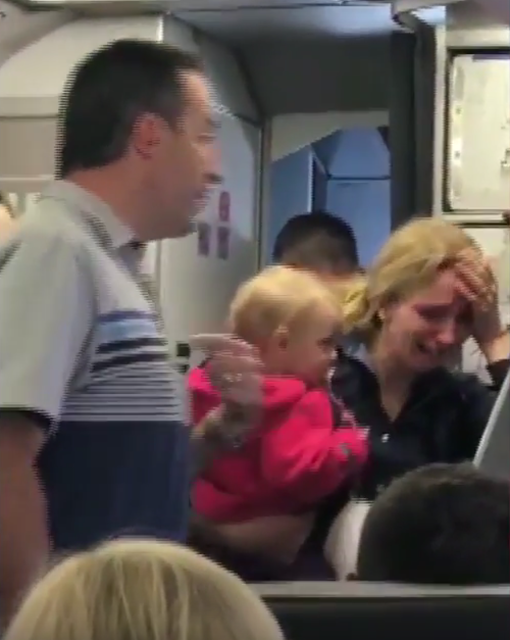 The video above displays only the later portion of this incident. What follows is a partial nonverbal analysis with emphasis placed on the escalating-deescalating body language dynamics. The pilot should not be leaning against the wall/restroom door. This casual act is very much out of context and is a mistake. 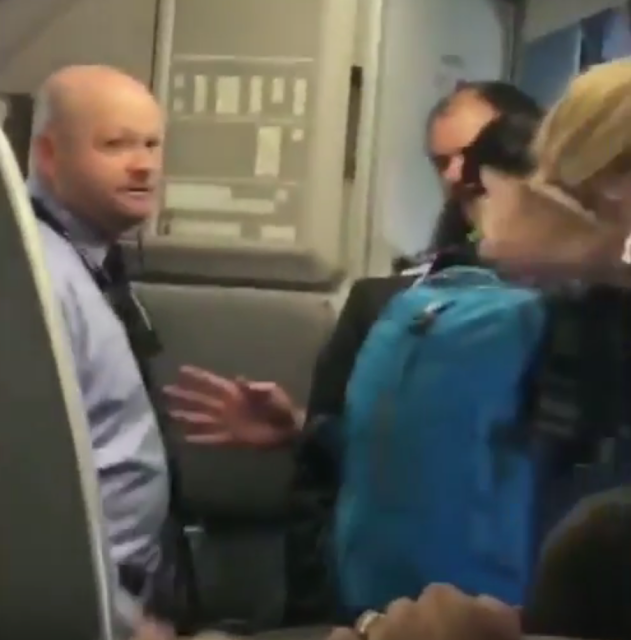 As the most authoritative person on the plane, by this nonverbal display, he was acquiescing and very much saying, "I am beta, would anyone else here like to take my place as the authority figure?" By his posture and arm position, it also appears as if he very possibly has his hand(s) in his pocket(s) which, in this cluster-context, truly screams that his emotional comfort is significantly diminished - along with low confidence. The captain's lack of assertion in this moment created a power vacuum and he lost a window of opportunity in which to take charge and thus to prevent and/or deescalate in a controlled manner, on his own terms. 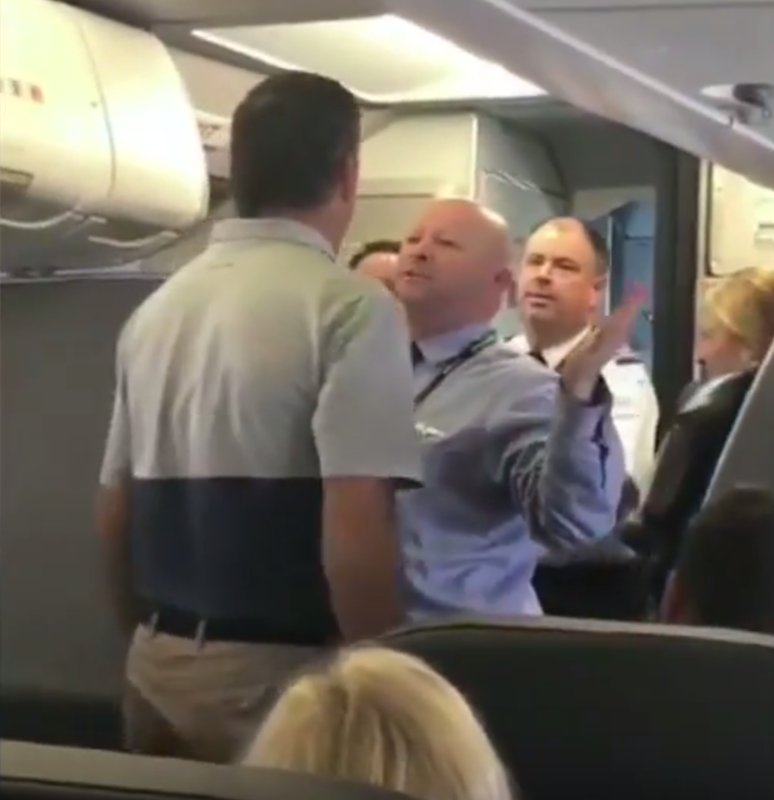 During 0:26 - 0:27, the intervening male passenger gestures a second time (the first occasion was during 0:25), with his left thumb. We can only see a portion of his right face, but there is enough of it visible to confirm his anger. Gesturing with one's thumb (rather than a finger) is wise in this context. It's one way to keep already escalating emotions from crescendoing too much. Notice also too, that his arm, particularly his upper arm, is held close to his chest (although, this is in part, very natural [for most people] in a crowded environment). The mere act of keeping one's arms close to one's torso, will help tremendously in down-regulating emotions (and thus keep anger from growing). 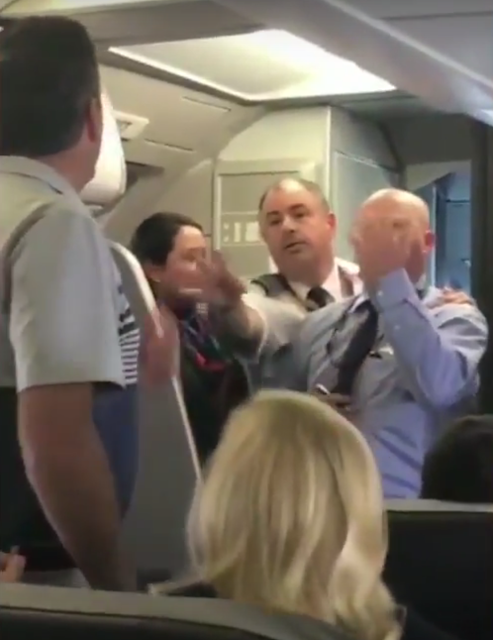 The intervening male passenger then turns his torso a bit more toward an unseen person as he points with his right index finger (forefinger) and his thumb. This is a key moment in the escalation of this incident. The act of pointing with our index finger immediately up-regulates the adrenaline level in our body (whether we are the one doing the pointing or being pointed at). This seemingly simple, yet very provocative gesture, dramatically increases the chances of physical altercation. Notice too, the male passenger's eyebrows have risen significantly along with his eyelids. We see more "whites of his eyes" (sclera). These changes are also highly consistent with higher levels of anger which instantaneously accompany his index finger pointing. 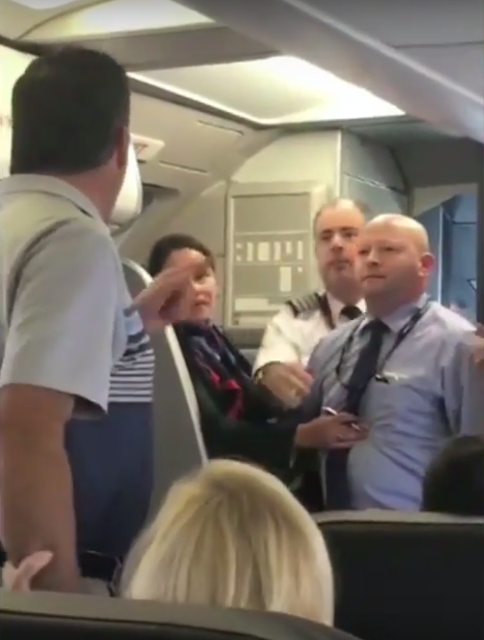 At 0:33, the male passenger points more dramatically at the same unseen passenger (presumably the male American Airlines employee) and "jabs" his finger as his forearm moves further away from his torso. This jabbing gesture (Illustrator) is a surrogate for, and often a preamble to a fist and/or weapon. 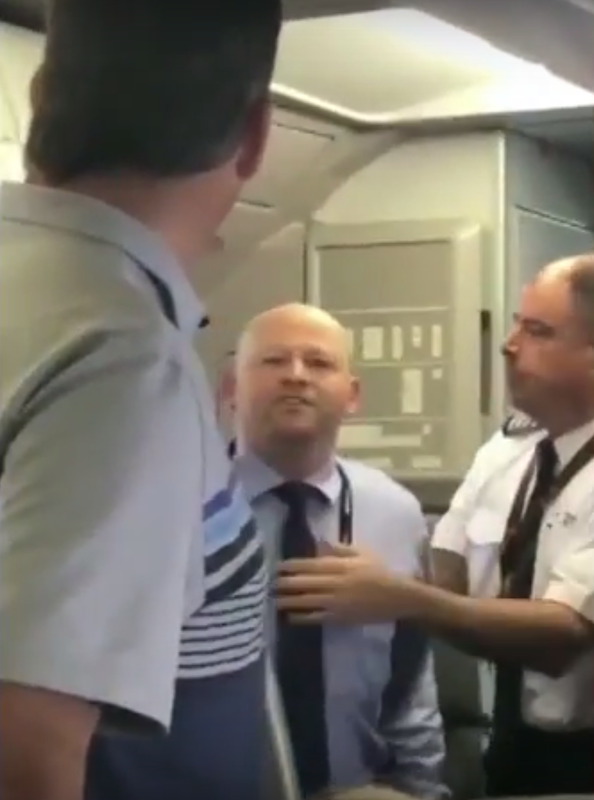 The male passenger then points at his chest (a split second later, also during 0:33), re-inserting himself as a central player in an incident in which he was not initially involved. He then returns to his seat. 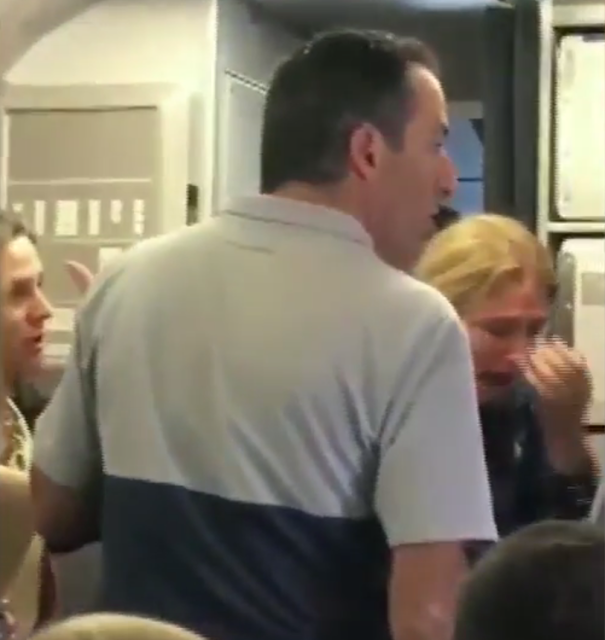 Individuals who have a tendency to inject themselves and behave in this manner - often will also be those who have a predilection for physical altercation, rather than solving a problem with dialog and diplomacy. 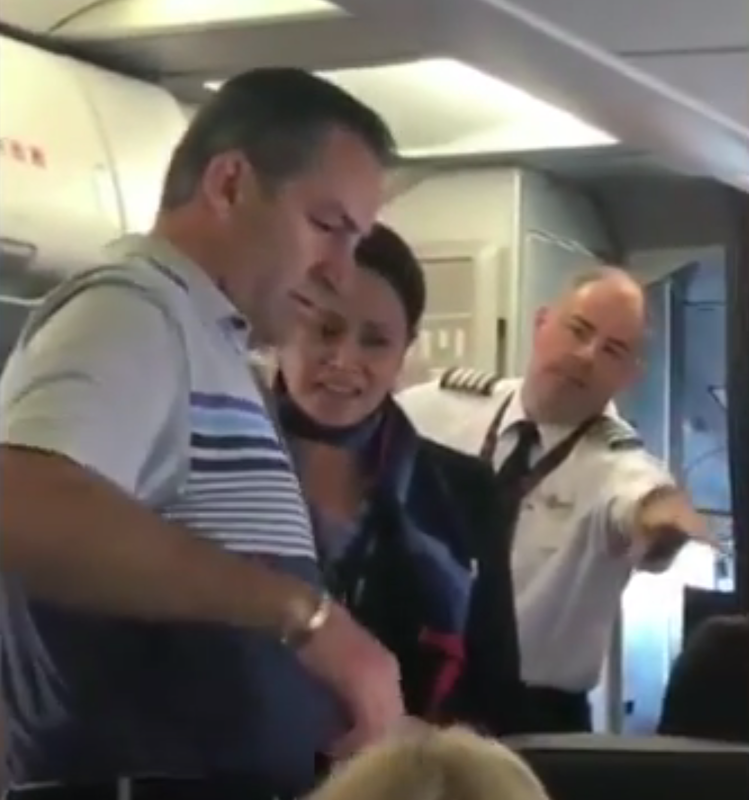 During the 0:46 mark in the video, after the same intervening male passenger shouts out to the American Airlines employee (who was speaking to the captain), the AA employee turns to the passenger as the captain gestures for his subordinate's refrain (although still quite half-heartedly). During 0:47, the male passenger then begins to again point with his index finger, only this time his arm is fully extended. 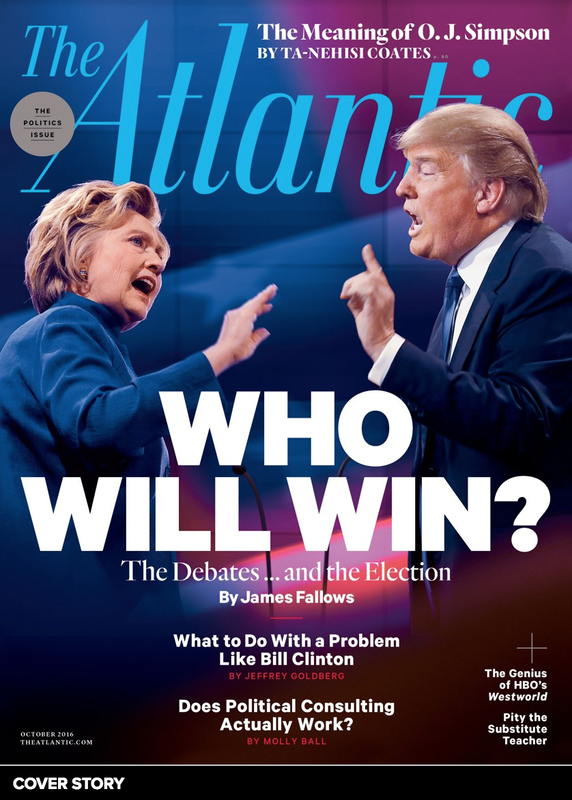 This full arm adjunct pointing (also with a jabbing motion) is particularly inflammatory and escalating. The American Airlines employee then responds in kind, mirroring the male passenger's hype-aggressive gesture (0:48). 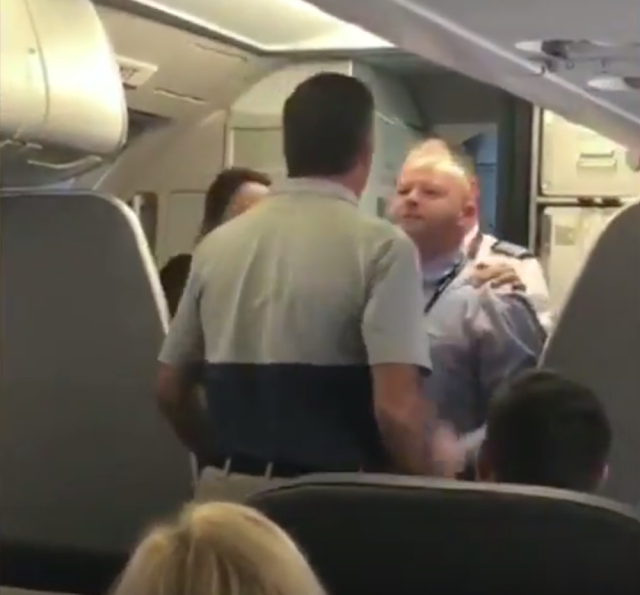 As the passenger aggressively approaches, the American Airlines Employee displays a palms-up gesture which is deescalating (0:51) - although it would have even more so if his hands were in a lower position. 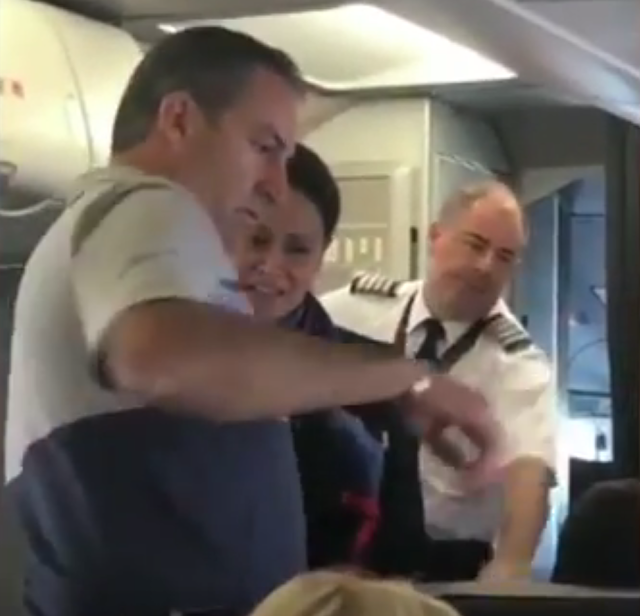 As the employee backs up, the captain's hand is on his shoulder, in this context, this gesture is deescalating (0:52). 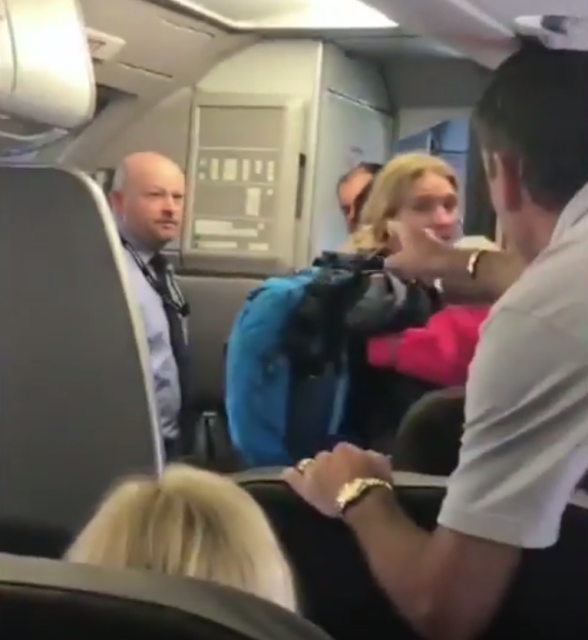 And the male American Airlines employee, with this extra protection/insulation from his co-workers - particularly with that of the captain (in addition to the passenger backing away), displays a classic "bring it on" escalating fight gesture (à la The Matrix). This is foolish - yet quite typical and predictable in order for him to "save face". 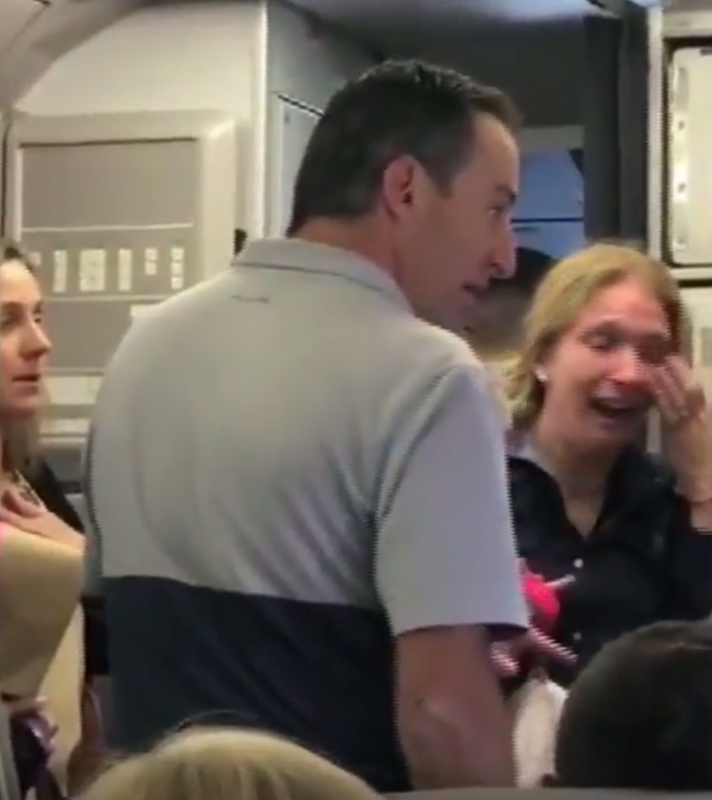 As the male passenger's female companion/friend/wife pulls his right arm (foreground), the male passenger feels a similar "need" to save face, by issuing one last set of finger-point-jabbing escalating gestures toward the male airline employee (0:59). 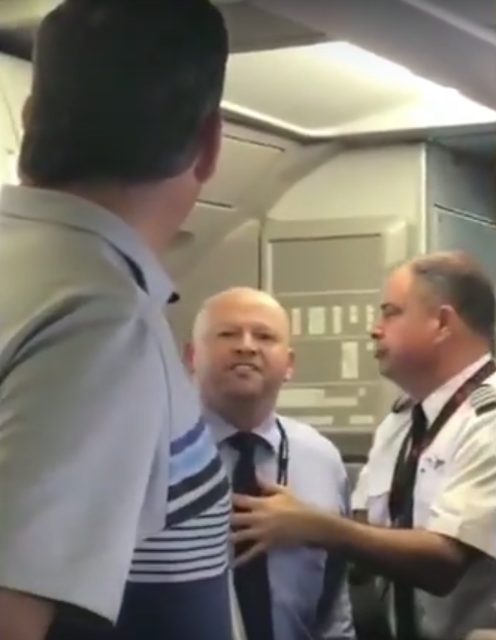 As the American Airlines employee is "herded" out of the plane with a hand on his sternum/mid-chest - with an attempt at argument re-engagement - we see an expression of contempt displayed on the employee's face (1:05). A second later, his expression has morphed into a combination of anger and classic disgust. Note the extreme nostril flaring and mid-facial tension - which are common to both aforementioned emotions. 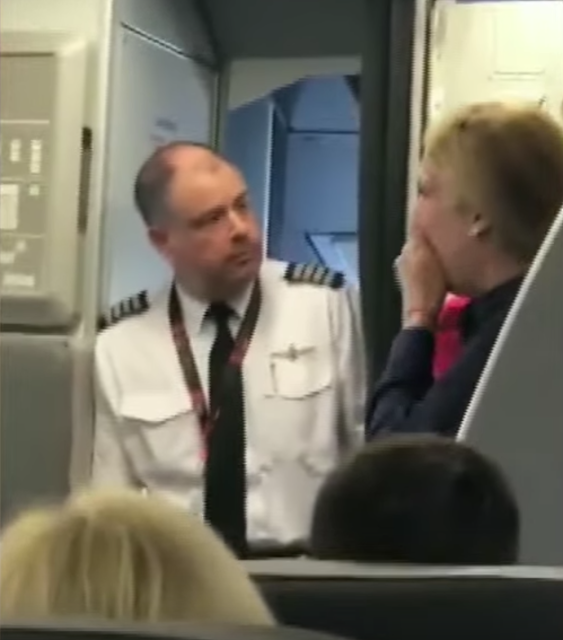 Once the male employee disembarks, the female flight attendant and captain - who were, in large measure, the default "neutral parties" incident - approach the male passenger. Their facial expressions are relatively calm, neutral - and therefore, non-escalating (1:08). The captain then displays a dominant, palm-down gesture (1:10), which, in this moment is superfluous and over-compensatory. In this last image, as the captain begins to turn away, we see a primary expression of regret with a secondary one of disgust (1:11). 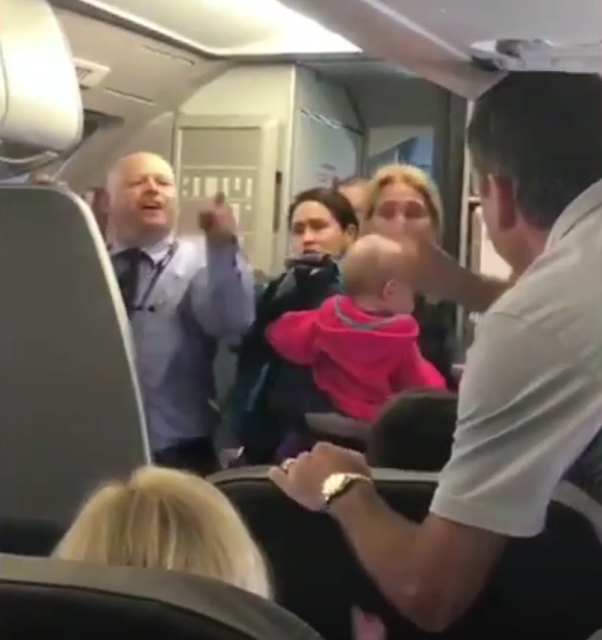 Summary: Although the details of the entire event are not currently available in the form of a video, what is viewable in this recording shows a very typical confrontational escalation behavior on the part of both the American Airlines employee and the male passenger. 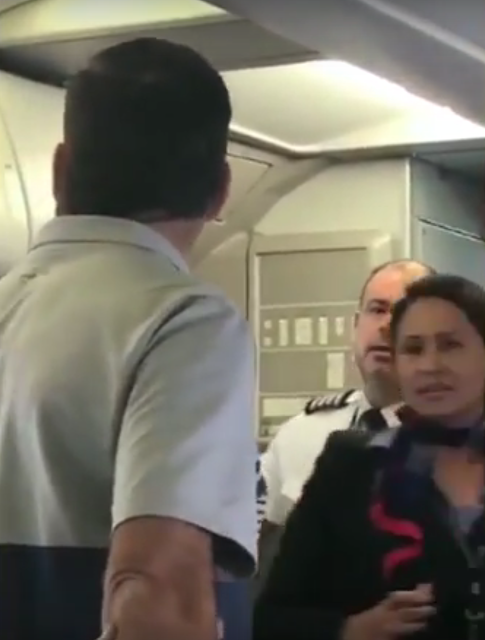 The captain could have largely prevented a good portion of this incident by being more assertive earlier. Being aware of one's own nonverbal behavior (as well as the others involved), in real-time, during such emotional moments, are of profound benefit in deescalating confrontational situations. 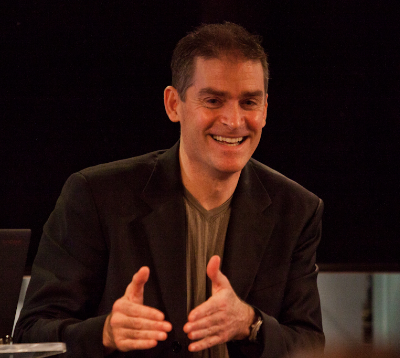 Relying on verbal-only techniques will result in a high degree of failure and loss of tempers (loss of impulse control). Nonverbal Communication Analysis No. 3914: Mike Pence's Recent Statement regarding Trump, "He's a Man of His Word"